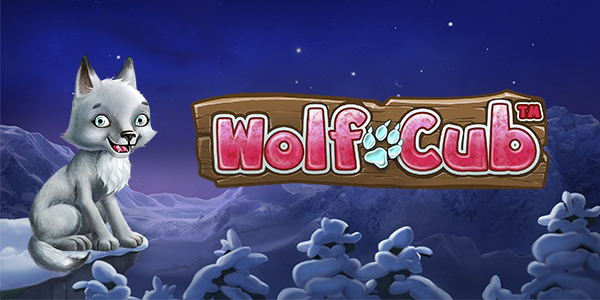 Back in February NetEnt released Wolf Cub slot game at all online casinos from the Betsson Group as an exclusive title. Like they do with more slot games these days. But now Wolf Cub is available at all NetEnt casinos, so no longer exclusive. Wolf Cub is a very cute slot game that uses 20 paylines and all symbols except scatter, appear stacked on all reels. This also includes a stacked wild symbol. Getting 3 or more scatter symbols anywhere will start the free spins feature. First all reels that have a scatter symbol on them will spin. These reels will now only have numbers on them and you are awarded the number of free spins that are on-screen in total. The numbers range from 1 up to 8 on each symbol, or even more. During free spins, if a symbol appears fully stacked on reel 1 the Blizzard feature is triggered. All matching symbols on the other reels will spread towards reel 1. Filling all spaces in between. So almost a guaranteed win. It is even possible to create a full screen of one and the same symbol. Wild symbols don’t spread to the first reel, unless the reel covers only wild symbols. Wolf Cub is a great new game with another new bonus feature we haven’t seen before from NetEnt. I am sure a lot of players will enjoy this new game. You can pick any NetEnt casino to try this new slot game, your existing account, or pick one of the top 10 casinos on the right to create one. Also watch the gameplay video below.